Dad does not think kale chips are toxic and I need savory snacks. Yes, I am a snacker and veggie sticks only can take me so far. When I did thirty days of raw last year the hardest part was missing savory, for the lack of a better term, comfort food. One of my culinary goals for the month is to create savory raw dishes. 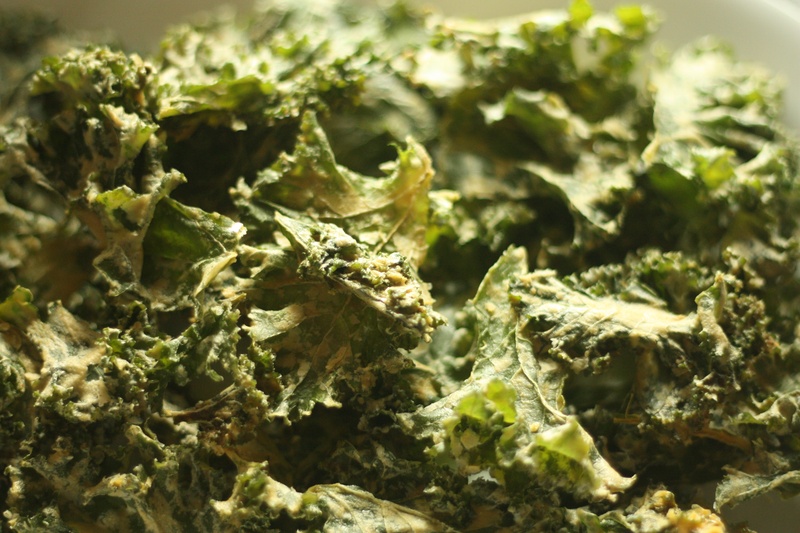 I have been dreaming of creating my own kale chips for months now but was scared for some silly reason. My mom has made them before so we collaborated. I spent some time reading as many recipes as I could find and came up with my own version. I had originally planned on using lemon in this recipe, but mom mixed it up for me and forgot to add it. So glad she did. These chips had a very parmesan flavor that really worked. I can’t wait to make a different version. I have found that the salt you use really changes the flavor of a recipe. If you have a Trader Joe’s near by, you can purchase Himalayan salt for $1.99. We used a dehydrator. I have read that if you aren’t concerned about the raw factor you can bake them at 300 degrees for 15 minutes. Put kale in a large bowl and set aside. Rinse your cashews and throw in a blender. Put in enough water to cover the cashews. Blend on high until creamy. Add remaining ingredients and blend until well mixed. Pour over kale and mix well. My mom just uses her hands. Spread leaves on dehydrator sheets and dehydrate on 115 degrees. Length of time will depend on dehydrator. We started removing them at about 5 hours. Eat immediately or put in an air tight container with some rice on the bottom to help keep out the moisture. It was a struggle to get a picture before my dad ate them all. I’ve never made kale chips either! This recipe sounds great. I am sorry to hear about your father’s illness, but I am glad that you and your family are beyond supportive, enthusiastic even, to help him manage it. An even closer family bond and some great recipes are an excellent silver lining. If I ever get around to making kale chips, I’ll let you know how it goes! So easy! Once you do it you will wonder what took you so long!